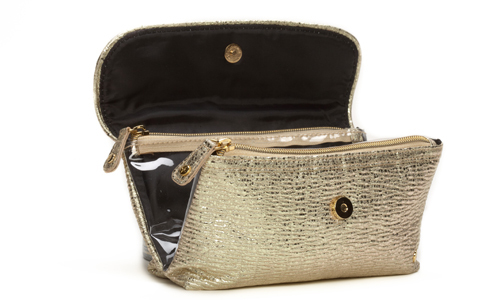 Stephanie Johnson cosmetic bags are my favorite bags for my makeup/skin care and everything in between. They are the only bags that don't fall apart within a couple months. For example, I'm still using my bag from last year's collection, and that's saying a lot. Especially since my bags go through absolute torture with all the travel and being thrown back and forth. They are high end luxury bags, that will make you feel glamourous. Stephanie Johnson makes bags come in all different shapes and styles. I love the way the site works because you can choose your material then choose the type of bag you're looking for, or vice versa. They are constantly updating their styles depending on the season. Many celebs have been caught sporting Stephanie Johnson bags such as Terri Hatcher, Jennifer Lopez, Heidi Klum, Britney Spears and Lindsay Lohan. Dare I say, Stephanie Johnson's Holiday 2011 collection is the best so far! I love the Winter theme and the sparkly textures. I'm sure all you beauty lovers will love the new collection too! So excited to show you guys the new Holiday bags! Once you choose your fabric, you can pick which bag you want from that particular collection. I was blessed to be able to see with my own eyes, the Rodeo Drive Gold Essentials, and let me tell you these bags are SO much more gorgeous in person. 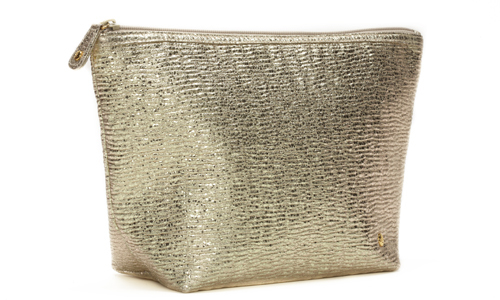 The shimmery gold really brightens up a room, and it's almost too pretty to use as a makeup bag. But don't worry, these bags are tough. Like I said earlier, I haven't had to throw away a Stephanie Johnson bag yet! They stand the test of time. A nod to the upscale Beverly Hills promenade known for high-end designer boutiques and all things opulent, luminous metallic gold cases glisten with effortlessly refined elegance. Lined in classic black and accented with signature gold Stephanie Johnson logo studs, style mavens everywhere will clamor to get their perfectly-manicured hands on this collection embodying luxury and sophistication. Doesn't it remind you of Rodeo Drive? The set is a bit smaller then their typical collection, with only two bags, the Katie & the Laura. 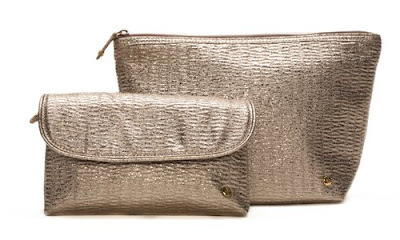 Check out the Katie Folding Clutch The Stephanie Johnson clutches are perfect for when you're going somewhere fancy and don't want to bring a handbag. This would be SO cute with a cute adorable New Years outfit, ( I know I'm thinking ahead) and a pair of gold heels! Love it! This delightful case unfolds to reveal two clear zip pockets, putting your precious cargo easily on display. Folds into a charming clutch shape, and secures with a snap closure. The 2nd half of this set is the Laura Large Trapezoid. This svelte yet surprisingly spacious trapezoid-shaped cosmetic case sits upright on your countertop or vanity for easy access to skincare, lotion, and all of your favorite products. When it comes to Stephanie Johnson large trapezoid bags, I use them for all my daily skin care must haves. It makes for easy travel, and can hold a whole lot! Keep in mind, this pretty package is much more GOLD in real life. In the picture, these bags look a bit on the silver side. 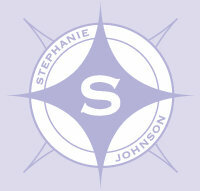 So what do you think about the Stephanie Johnson Hollywood collection? This is only a sneek peek at what's to come this season. I think they scream Winter and vintage Hollywood. The Giveaway: One winner will win the same bags I received, The Rodeo Gold Essentials ($85 value!) To enter, fill out the google form below. Contest will conclude 9/26/2011. Open to the US only. Winner will be chosen by random.org and will have 48 hours to respond to the winning email. No Po Boxes please. Cheaters will be disqualified.